Musa velutina is a very slender species from North East India, very fast growing. This ornamental banana grows to about 6 feet tall. The plant will stay smaller if grown as a container specimen for cooler climates. Can be used in tropical cut flower arrangements. This ornamental banana produces pink/red bracts. Blooms appear year-round. Extremely quick to flower, can flower when only 3 feet in height. 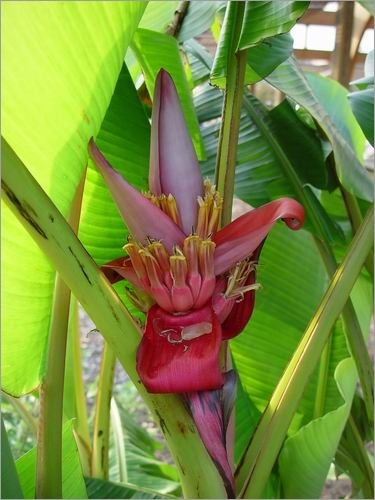 The small pink velvety bananas are about 3 inches long, with white pulp and small black seeds. They are edible and quite sweet, but also full of seeds. Leaves oblong, 1 meter long, 30cm wide, mottled in a green / wine pattern, pale with a dark red-purple midrib below.